Nelson DeMille has been pumping out thrillers for almost 40 years. Starting with By the Rivers of Babylon in 1978. His career has included a number of series including, most recently the John Corey novels which began with Plum Island and ended with appropriately A Quiet End. 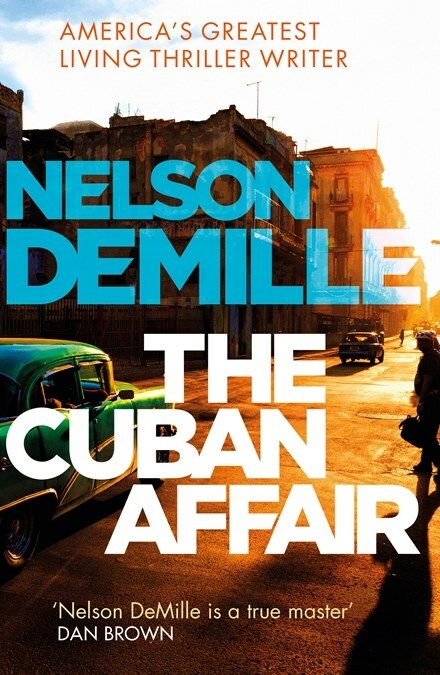 While The Cuban Affair is a stand alone novel it feels like DeMille is contemplating a new series of books with a new hero Daniel ‘Mac’ MacCormick. Mac, an veteran of a number of tours of Afghanistan (or as he calls is Allfuckedupistan), now runs a charter boat out of Key West. He hangs around in the local bar and takes tourists fishing or on sunset cruises with his crew mate Jack, himself a Vietnam vet. Both are somewhat bored with their lives so that when Mac is approached by some Cuban Americans to go into Cuba and retrieve a huge sum of money hidden before the revolution, he jumps at the chance. Helping him in his decision is the beautiful Sara Ortega who is to accompany him and a payday of three million dollars. This is a slow but intriguing set up. The timeframe of the book is during the Cuban Thaw with America, Fidel Castro is still around and Mac’s employers are keen to get their money out before any further thaw happens. They use a fishing competition as cover to get Mac’s boat to Cuba and Mac and Sara enter the country on a cultural tour. From there however, despite some slightly tense scenes the book becomes, for the most part, a cynical travelogue of Cuba. DeMille himself went to Cuba on one of these cultural tours and besides sending himself up (as a writer in Mac’s tour group), he also clearly wants to share the sights and sounds of Cuba. And while this is interesting, it does not really make for much of a thriller. Mac himself is a typical DeMille hero – military trained, snide sense of humour, killer with the ladies (although with a sensitive side) and handles himself well under pressure. It is no surprise that the fake romance with Sara turns into a real romance in which trust issues play a part as very little about the mission is what it first appears. The tension only really steps up a gear in the final quarter of the book and DeMille shows why he has a reputation as a great thriller writer. The action is tense as the bullets fly in a chase across a stormy sea. But this is all too little too late. The rest of the tale does not fire in the way that some of DeMille’s other novels have. For readers interested in Cuba, its history and its people, albeit from a very gung-ho, American perspective, The Cuban Affair may be the book to read. Those looking for thrills and action may need to dip a little further back into DeMille’s back catalogue or wait for the next Mac MacCormick adventure.